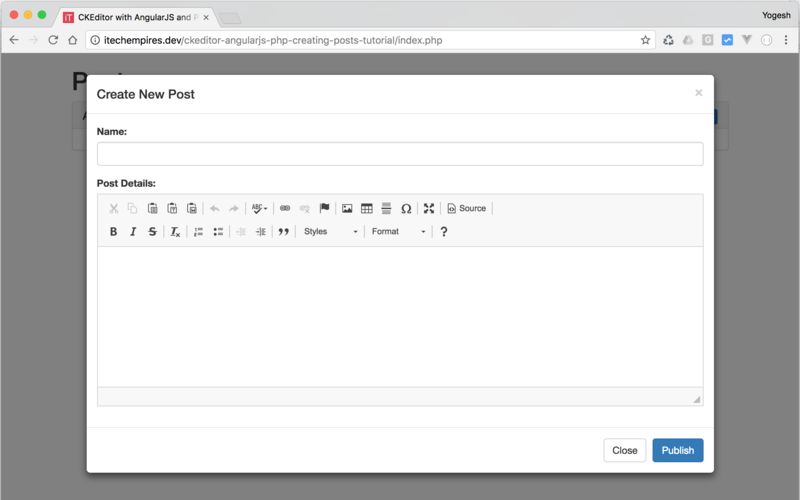 How to Use CKEditor in AngularJS and PHP? In my last tutorial I have given details on how you can work with AngularJs using crud application, In this tutorial I am going to provide solution on how to use CKEditor while using AngularJS into your application, here I will provide a sample demo using PHP to demonstrate use of CKEditor in angularJS. 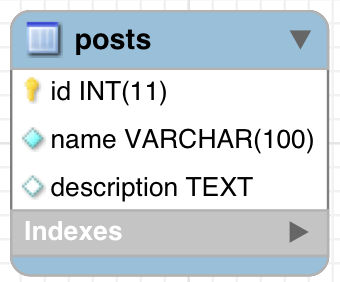 Create new Database and add new table called posts or you can simply use following script to create new table. Let’s start by creating the folder for the application to store sample application files, so go ahead and create new folder to in your php environment setup it can be lamp, xampp, mamp or homestead totally depend on your system php environment. I am assuming you have your application folder ready to go along with the database that you have created the in the first step. 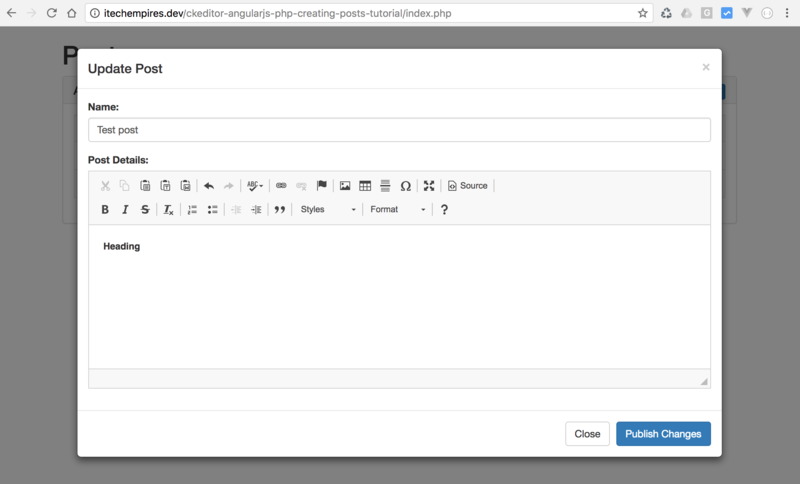 Create new file called index.php inside the application folder and setup basic html page according to the given script. In the above script we have added bootstrap, AngularJS and CKEditor, jQuery Library to use and to reference this libraries I am using there CDN version, if you want you visit there website to download source and reference them into the page, it’s all depend on your requirements. it doesn’t matter either on will work. If you review above file line by line you will see at the start of the body section I have added ng-app directive to define angularJS module and next I have added ng-controller directive, keep in mind we are going to use those while writing our angularJS script. Next I have added basic design with bootstrap panel and a button to open up the modal popup along with the ng-click event and then I have added the modal popup to be able to perform the add new post functionality. If you notice under model popup we have <textarea ck-editor ng-model="post.description"></textarea> element here we have added custom directive for CkEditor, just keep in mind about this directive you have to notice we are going to create that in the angularJS script and this would be the directive which is going to be the responsible to replacing this textarea element to CKEditor. In this step we are going to write basic require angularJs script to start, so go ahead and add new folder called js and a file under the same folder called ng-script.js if you notice clearly we have already added reference to this file in the above step. In the above script at the very beginning we have declared angular module which is going to reference to the ng-app directive which we added inside index.php page and next we have a declaration of postController again same we have added inside index.php along with the ng-controllerdirective. This is the place where we are going to have our script to handle post basic operations, right now we have added a post object and method to handle add post click event to open up the model popup. In this step we will needs to create a directive which is responsible for replacing the html element to CKEditor, go ahead and open up the our script file and add following directive right after the postController. With this above directive we all set to go and play with the our demo to added basic add, edit, list and delete feature. If you go ahead and run the application with the current state and click on add post button you see the following output, which is exactly what we want a CKEditor element where we can add our post detail content. Open Database Connection file into your editor and add following script and make sure you update the database connection setting variables according to the your php environment settings. So our PHP api is all set to handle backend operations, now we just need to call this api from angular js and to work on the posts. Now if you run the application and try to add new post it should work, but you won’t see the list right after adding new post, following next step to list all the post. Now if your run or refresh the application you will see the list will be there and if you try to add new post it will be append to the existing list. Now if you try to delete the post from the list it should work.